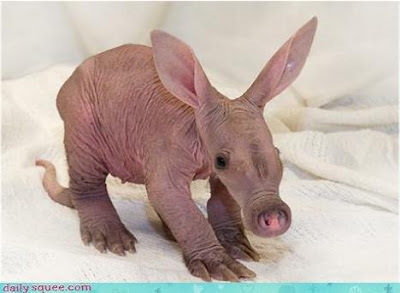 Rebecca sent this along, and neither she nor I can decide if it's cute or ugly. I'll let you decide. Ok, now I see it. It's ugly. My initial thought was "YIKES!" But upon further inspection, it's totally cute. Sort of. it looks helpless. helpless = cute. i am on the fence...i think it is both...so ugly it is cute...and it's a baby=cute. cute and ugly definitely, I like this blog. We've got a couple at the zoo, if you'd ever seen them asleep together, on their backs under some heatlamps...with meerkats climbing all over them, you'd definitely are they are cyoot!! OMG, absolutely adorabale. I wanna hug him and kiss his widdle bald head. Give it a sword, it's cerebrus son.